Natalie led the group to lunch today. 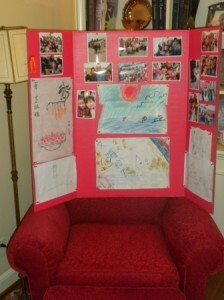 She took us to a dumpling place that she, Austin, and a couple other students had gone to earlier on the trip. She personally had no difficulty asking for the correct menus (pictures are nice) and helped us figure out what to order. It’s hard to express how wonderfully relieving it is to have someone who is not afraid to communicate. The waitresses were kind of hard to work with at times but Natalie made it easy and all eleven people left the restaurant happy and satisfied. We even got a free liter of Pepsi because we were such good customers. Today we all went to a Chinese Traditional Medicine Clinic (acupuncture and other related practices) just around the corner from the Lotus office. The doctors gave us a brief introduction of their practice. Unfortunately a lot of it is kind of abstract and hard to explain…especially in another language, which is what they were trying to do. Ying and Yang is very important in this practice. From what I understand, one way of looking at Ying and Yang is cold and hot. The body has two systems (I think…don’t quote me on this), an internal system and an external system. In order to be healthy you want your qi (think of it as the movement of energy although it is not defined as energy) to move well throughout your body. So an unhealthy person might have one part of their body system either too hot or too cold. Once the doctors figure this out, they have methods to get rid of this imbalance by moving a person’s qi. When they move the qi and creat balance, they are able to cure injuries and sickness. I thought it was fascinating, and so did everyone else. Eric got acupuncture and some kind of cup suction thing (there’s a better name for it I just can’t remember) to help with his stomach. CJ got special treatment for his acne and back. Kelsey got treatment for her knees. The suction cup treatment (almost everyone got this) is kind of weird looking. In order to make the cup stick to the skin, the doctors put a flame in the cup, heating up the gas inside slightly, and then put it on the skin (it doesn’t hurt). When the gas cools, it compresses and forms suction. Many suctions make the skin turn weird colors. This was the cause of a great deal of entertainment for the Maret crowed. The doctors, however, said they could tell how one’s qi was moving based on these colors. Everyone got a turn. If they didn’t want the regular treatment, they could get a massage…it was amazing! After a couple hours of the most entertaining medical treatment I’ve ever had, we took a picture with the physicians and said our good-byes. I just thought I would mention that Kelsey has had a wonderful idea to see some Beijing opera. Ms. Cohan is going to try and get some tickets to a teahouse type place where a group of people can go and watch small clips of opera. Today students got to do some shopping in one of the few parts of Beijing that has not been completely changed by construction. I have to say it I liked the old street and shops. It made me feel like I was in one of those old Chinese martial arts movies. Bargaining seems to have become second nature for Maret students. I just hope everyone remembers not to do it too much when they get back to America… might not work out so well. Evan got a fake Rolex (don’t worry, he knew it was fake and that’s how he got it at a low price), Olivia M. got a pretty poster…lots of cool little things. I got a “Chinese Chess” set, and as soon as I get a free moment, my host dad said he would teach me how to play. He warned me that I would not be able to beat him, though : ). Some students decided to stay for some more shopping and others decided to return home. If you ever visit Beijing, I think this is a really cool place to go. I added two pictures of some of the objects in the Capital Museum if you want to get a small taste of what we saw. Everyone piled into the Lotus bus (contrary to my verb, it was actually quite cozy) and chatted away for the hour and a half bus ride to the Great Wall. The first signs of the Great Wall were little lumps on the top of some of the surrounding mountains. It wasn’t until we had driven up the side of the mountain to the part of the wall that had been restored that the wall became visible in full form. Some students, including Eric, Ben and Will, decided to grab some food at Subway (conveniently located some 100 feet before the ascent up to the Wall) before tackling the Wall. Others, including Olivia D., Alex, Austin, Olivia M., Evan and Andy went ahead up the hundreds of steps to one of the lower parts of the Wall. Many were already tired by the time we reached the lower part of the Wall, but all aches went away at the amazing landscape on either side of the wall. The Wall majestically snaked along the tops of the surrounding mountains. Not only was the countryside beautiful, but there was a nice breeze to cool us off from the hot day. If you want to meet some fellow travelers, the Great Wall is the place to go. My group alone ran into at least ten people who were from America’s east coast, including Virginia, Maryland, and DC. I heard from the other group that they went a different way along the wall (there are several options) and some got to ride down the mountain on a very large slide. I got to do it last time I visited Beijing and it is very VERY fun. I only wish everyone had had a chance to ride down it. After climbing for four or so hours (less if you wanted to), we reluctantly got back on the bus and headed back home. Some students got to practice their bargaining skills (a very important skill in China) in the shops adjacent to the parking lot. I have to say I was very impressed. 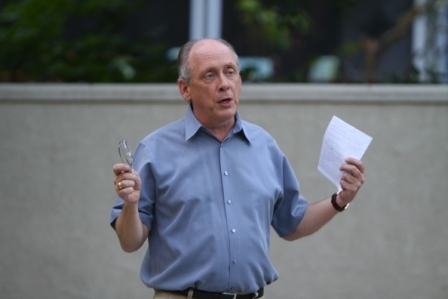 No one was too timid, and many came back bearing t-shirts and chopsticks, stuffed animals…. If and when I get some pictures I will add them to this post. I remember one of my Acupuncture teachers telling me that acupuncture/acupressure can help with jet lag so when I was preparing for my flight to China, I made sure to put this on my things to do list. I found this link that explains it from AB to C (see below). I did it and it worked! My friend, in Hong Kong, was so surprised that I wasn’t more tired than I was. Don’t get me wrong, I wasn’t bouncing off the walls with energy but I wasn’t trying to crawl to a bed during the day. I definitely think it was party due to the acupressure as well as the other advice the link offered; to set your clock to the time of your destination as soon as you get on the plane and act as if you are already there (i.e. sleeping, eating, staying awake, etc). I hope this helps some of you on your trip to and from China. I know I will be doing it on my return flight home! The Rain cleared up the Beijing sky to an almost pure blue. I have to say there were some mountains outside the Lotus office window that I didn’t know existed. Museum. 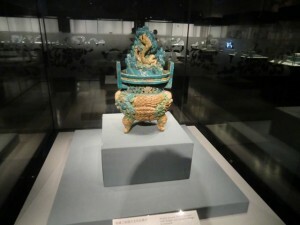 Every floor displayed countless pieces of priceless artifacts made of Jade, Gold, Bronze and pottery. 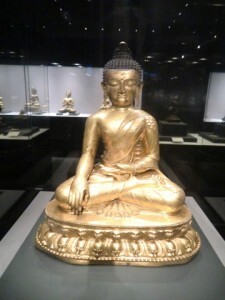 As Buddhism was very prominent in early China, there were many statues of different Buddhas. On one of the top floors there was a display of “Jingzhu”, or the Beijing Opera. The costumes are some of the most beautiful clothes I’ve ever seen. On our way back, Evan, two other Lotus students and I decided to take a taxi just for the heck of it. I thought it was kind of funny how comfortable Evan was with giving the taxi driver directions. The Lotus address just rolled off his tongue. Nice job Evan. 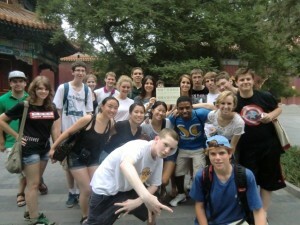 Today we visited the Lama temple (Yong He Gong), home of a 18 meter high Buddha (sorry I couldn’t get a pic)! All carved from one sandalwood tree! If I remember correctly it’s also the largest Lama temple outside of Tibet. 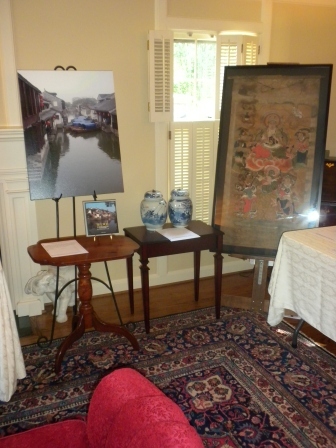 Lisa Sheng, the director of Lotus, and a new intern both served as our tour guides. They both also challenged us with some Buddhism trivia. Eric and Alex were a couple of the winners. I didn’t get to see exactly what they won, but they were small books of some kind from Taiwan. 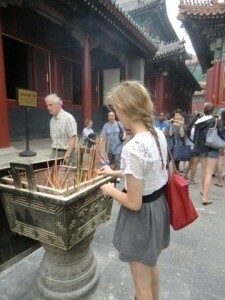 In the picture to the right, Kelsey is lighting some incence in the traditional way. A lot of Maret students were pretty tired…it’s a fair amount of walking to go places, but many students stayed in the area for a little while to go shopping before going home. As it turns out, Beijing also had huge rainstorm that evening… as people were going home. Me, Sean, Ben, and others had to wade through six inches of water on our way back from the subway! My poor leather shoes are still drying on the veranda. Today was my third day of apprenticing at the Traditional Chinese Medicine (TCM) clinic located only steps away from the Lotus Foundation’s building. From the short amount of time I have spent with Dr. Pieu and his colleagues, I am happily surprised to find out that I have learned the same theories and foundations of TCM in New York City as they practice here in China! Apprenticing at the clinic reminds me of why I decided to get my Masters in Acupuncture; I love how TCM focuses on holistic healing… diagnosing and treating the patient’s mind, body and spirit. TCM practitioners take into account the patient’s lifestyle, internal or external stresses, diet and exercise, etc. Being a recent graduate, I am inspired by observing the patient’s treatment process as well as talking with them. They tell me how much they love coming to the clinic and how much it helps them. One patient told me that, “it doesn’t only heal her body but also her heart”. That is exactly why I choose this profession… to help people in their healing process whether it’s physical, emotional or spiritual. Yesterday’s highlight (except for when Dr. Pieu said that I am a fast learning and I would only need another month or so to be proficient in their “finger acupuncture” technique) was observing Dr. Pieu perform a bloodletting technique and Ba Guan together. I have done the bloodletting technique and the Ba Guan technique individually, but not together. Basically, the first thing you do is use a tool called a “plum blossom hammer” which looks like a tiny hammer with 7 needles on the head. You lightly tap it on the skin until a few tiny blood droplets surface on the skin. Then, you put the glass cups (Ba Guan) on top of this area in order to act as a vacuum and suction the blood out of the micro holes you just created. The way you create the suction action is by quickly putting a small flame into the cup and pulling it out and placing the cup on the skin. The heat removes the air which causes a vacuum effect. The marks that it leaves can be off putting to some but if people are told ahead of time that the marks are temporary as well as educating them about the positive effects of the treatment, it won’t be a negative experience. 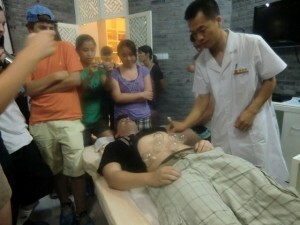 In TCM terms, this type of treatment helps to move the stagnation of blood and qi. In western terms, it can help with colds, respiratory problems, musculoskeletal pain, digestion, etc. While watching Dr. Pieu, I thought to myself… it’s great that this type of treatment is generally accepted in China and I hope that people in the U.S. will start to accept this more. I believe it is. It seems that the western world is adopting eastern philosophies more and more. 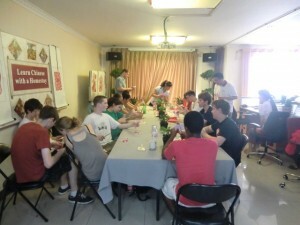 This afternoon we learned how to make traditional Chinese paper cuttings. This Chinese folk art involves cutting intricate pictures out of thin red paper, which may then be pasted onto a white piece of paper for display. First we cut a traditional Chinese design followed by a butterfly and a flower. I asked and the teacher helped me cut out a pair of birds kissing each other. It was pretty cool. I asked and she said that one of her paper cutouts could take up to an entire day to cut! That’s a lot of patience and accuracy. 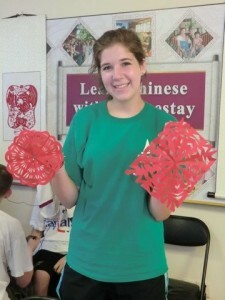 Some Maret students (Alex, Natalie, Olivia D. …) decided to get creative and show off some good old American paper cutting (Yay snow flakes…). 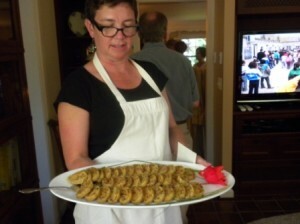 The Lotus faculty and the Teacher actually quite liked them. I think it is safe to say that everyone has now found a rhythm. Today Austin and CJ talked about getting together and playing some pick-up basketball with some of the Chinese kids who play near Austin’s house. Sean, CJ, Ben and Will are meeting at one of their host family’s houses (with their families’ approval, of course). 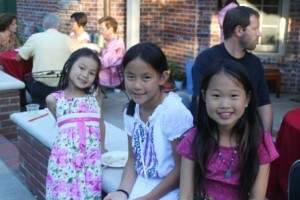 Natalie, Olivia D. and Kelsey are doing something similar. I talked with Andy and Evan about what they did with their families on Sunday: Andy went swimming and shopping with his family, and Evan went to a food market. I am sure that was fascinating: I went to one as well, and, having never been to one before, I couldn’t help but think how far all of the products must have traveled just to be accessible to thousands of people….maybe more. It feels like the real food markets are all kind of hidden from the foreigners, and I was one of the few privileged enough to see it. It was a very neat experience. From all of this, anyone can see that everyone has become much more comfortable with Beijing and is doing very well. After class today we ventured to the ever hot but nevertheless always well populated Olympic Park. Despite the heat, there was no lack of enthusiasm from the group. Now Maret students walk up confidently to food stands to ask for water and snacks. When Evan brandished a full cone of cold, succulent, mouth watering, chocolate covered ice cream, students such as Austin raced to the closest food stand. While in Olympic Park we strolled around to see the various famous structures (as you can see from the pictures) and Will found someone else who was willing to punch the ground in front of a camera (although the guy did have a Mickey Mouse suit on, so it’s a little less impressive).